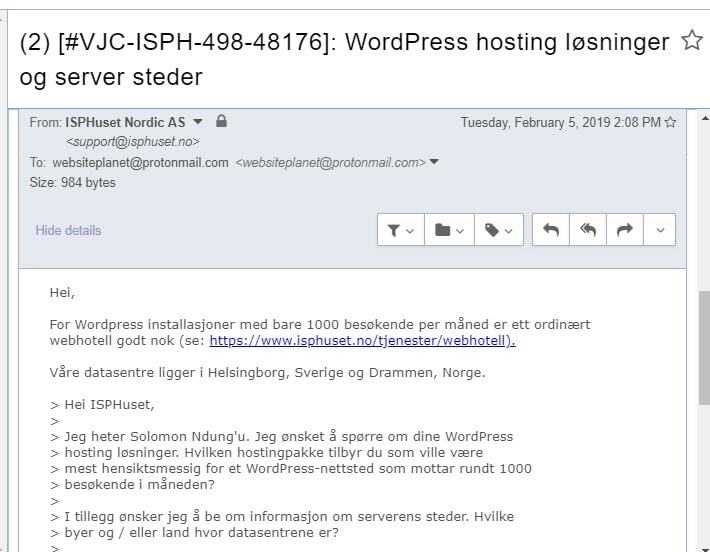 ISPHuset Review 2019: Is ISPHuset a Good Hosting? Founded in 1998, ISPHuset has over 20 years of experience providing web hosting, hosted exchange, domain name registration, virtual private servers, and dedicated servers solutions. With its two data centers in Norway and Sweden, ISPHuset serves more than 70,000 esteemed customers across the world. ISPHuset is a Norway-based web hosting provider founded in 1998. ISPHuset has two data centers in Norway and Sweden that provide the backbone of this company’s web hosting solutions. The company is ranked among the top 30 largest hosting companies in Norway by market share. And currently, they are responsible for hosting over 70,000 customers worldwide. The ISPHuset website is only available in Norwegian. ISPHuset uses virtual servers that are powered by Hyper-V from Microsoft as well as Xen/KVM from OnApp. This improves the performance and reliability of the vendor’s virtual servers. If you need dedicated servers, this vendor offers two configurable dedicated options that can cover most of your hosting-needs: Dedicated Server Standard and Dedicated Server PRO. Both of these packages come with enough memory, disk space, and CPU power for almost any task. The Dedicated Server Standard package comes with Single CPU Quad Core e3 3.4Ghz while the Dedicated Server PRO comes with Dual CPU 6-Core Intel Xeon e5. The ISPHuset shared web hosting solution is available in two packages: Web hosting Standard and Web hosting Pro. Each of the two is available for both Windows and Linux OS platforms. Web hosting Standard is the cheaper package. It comes with 1GB disk space and 10GB monthly bandwidth. Web hosting Pro is the premium shared hosting package and includes 10GB disk space and 300GB monthly bandwidth. Both plans come with five free email accounts with 5GB storage space each. ISPHuset customers are somewhat satisfied with its availability. All the same, the vendor does not commit itself to an uptime network guarantee. While this hosting provider offers backup services, they are available as an additional solution billed separately. In addition, its website is unappealing and a little too basic. The vendor performs nightly incremental backups as well as monthly full backups in its efforts to safeguard its customers’ website data hosted on its servers. ISPHuset can also offer off-site backups to its data center in Sweden upon request. ISPHuset shared hosting solutions are quite expensive. This is possibly because the vendor includes a free DV DigiCert certificate and five free email accounts with an allocated storage space of 25GB in its packages. Though the prices are listed without the Norwegian krone sign, I guess it is assumed that they are in that currency, given that the vendor targets businesses in Norway. ISPHuset has flexible billing cycles that include monthly, quarterly, biannual, and annual subscriptions. The hosting firm offers no free trial or money-back guarantee. 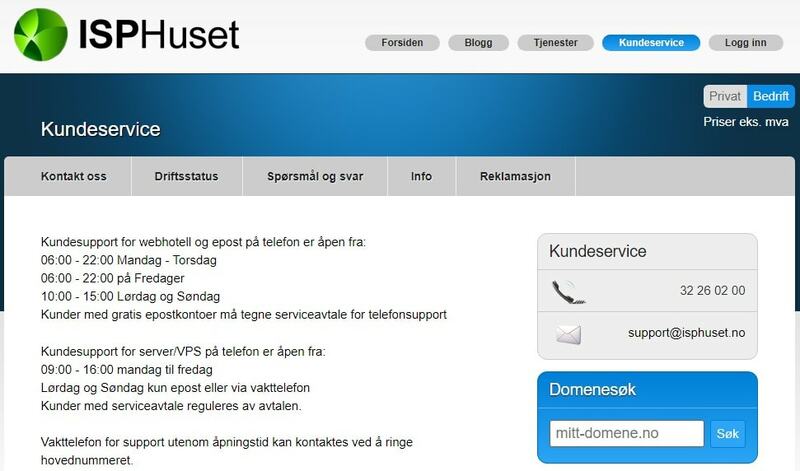 You can contact ISPHuset’s technical support team via telephone, ticketing, and email but not live chat. It is available 24/7 and goes out of its way to offer satisfactory hosting solutions to its customers. I sent the vendor a support email inquiring about its WordPress hosting solutions and got a response in less than 3 hours. However, the vendor does not have a knowledge base set up on its website. ISPHuset is a great web hosting vendor for both individuals and businesses. The vendor has invested in both the hosting infrastructure and support expertise to handle most SMEs. Its highly responsive support is a delight, and a major reason why many small and medium-sized businesses choose its hosting solutions. 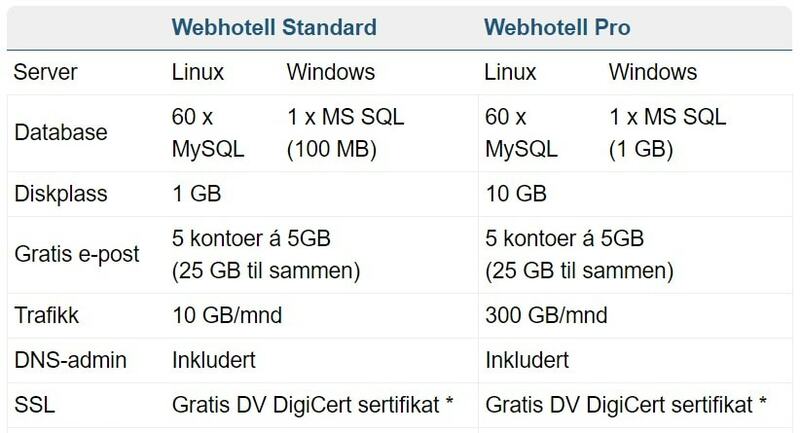 Wondering how ISPHuset stacks up against other Web Hosting companies? Enter any other Web Hosting company and we will give you a side-by-side comparison.